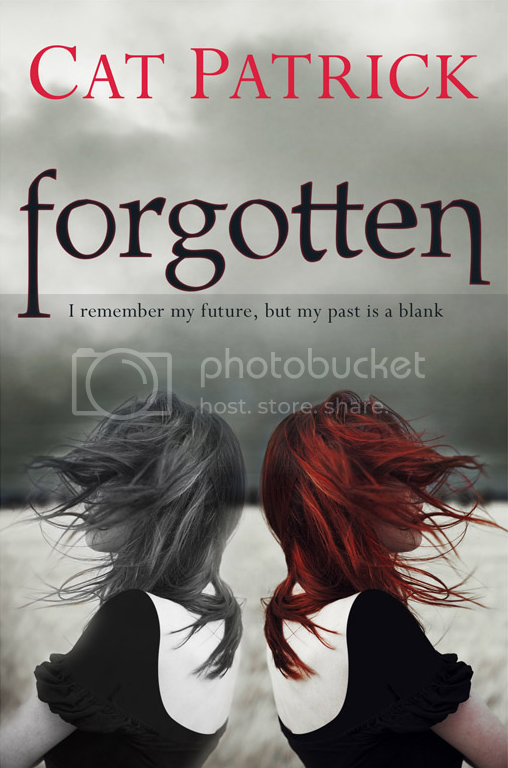 I was lucky enough to be asked to kick off the blog tour for Forgotten by Cat Patrick, the amazing debut novel about a girl who has no memory of her pasy, but remembers her fuure. Read on for A Day in the Life of Cat Patrick. Breakfast (wow, this is riveting stuff): Usually something packed with protein like a mini wheat bagel with almond butter, a cheese stick and a hardboiled egg. I’m off the sauce—caffeine—as it gives me migraines, so now I’m drinking decaf English Breakfast tea with milk, no sugar. 8:30 a.m., when hubby leaves for work. I take over with our twin daughters, who have hopefully been fed and watered by this point. Between now and about noon, we do things like read books upon books from their bookcase; build with LEGO bricks; go for walks to look at rocks, slugs and ducks; put on tutus and have dance parties; color and paint; squish clay and scooter around the house or the neighborhood. At not quite 3 years old, sometimes “we” are bossy, but we are always very cute, offering Mommy at least 15 belly laughs a morning. From about noon to 2:30-ish, the girls have lunch and either naptime or “yaptime.” One of my daughters recognizes the value of rest and the other prefers to sleep for 15 minutes then tell stories for an hour with the help of her stuffed lovies in her crib (imagine me glowing with pride at her young storytelling prowess). The afternoon is a repeat of the morning with the girls, only we tend to go out more because where I live, the afternoons are the sunnier part of the day. Then it’s dinner/bath/bedtime for the girls. After toddler bedtime, I go back to work for awhile until hubby gets home. Often on Saturdays, he has Daddy Duty and I work the whole day, which is both luxurious and torturous because I’m missing out on that family time. But we make up for it on Sundays. There are mornings when I have help: a nanny comes for three hours on Mondays and my mom donates two other mornings of her precious time, so that’s when I really hunker down and get productive. But really, my days are very much centered around my kiddos. Because as much as I love writing, I live for those little monkeys. Of course, that’s not to say I’m not a tiny bit excited for preschool to start next fall (she types guiltily…). If you’re still awake, I thank you kindly for reading. Thank you, Cat, for such a cool post! Forgotten is released on 6th June (TODAY PEOPLE! ), and you can buy it from Amazon UK and Amazon US. And if you need convincing of why, you can read my review, and my interview with Cat Patrick. Be sure to check out Cat Patrick's website. Now I am wondering whether I discussed with Cat the joy of twin girls! I have been through that stage and came out the other sided. Twins are lovely but really hard work. I am amazed you find time to write when they are so young. I really struggled to get organised at all. I think it sounds like a lovely day! Mine is pretty similar (without the helpful nanny, wahh! but I guess I do have similar equivalents)! I love the diversity and just sheer fun that is added to my day looking after two small children. Fantastic. I've only got the one child and I can't get that organised! My copy of Forgotten arrived on Friday and I'm really looking forward to reading it. I've got the UK version (as that's where I live) and I LOVE the cover. It is so pretty!